This month, it’s the South Coast calling once again for me and my water babies. Actually, being honest, I’m the real water baby of the family, the girls will generally only go in up to their knees, no matter how many shrieks of encouragement they receive from me, says actress and dog lover Ali Bastian. I grew up on the river Thames and was lucky to enjoy summers filled with swimming and messing about on boats. The moment I’m near water I feel any tension I may be carrying begin to fall away. Couple that with the soothing, mind clearing sea air and suddenly I can breath a little deeper. After completing a particularly hectic but incredibly enjoyable filming schedule this summer, I was ready for some serious R and R. And if there’s one thing I’m good at, it’s putting the ‘resting’ into Actor! For most of us, in all honesty, the down time is pretty involuntary. However, over time, it’s become a part of my life that I honestly enjoy and appreciate as much as the busy periods. It’s taken me a while to learn this lesson. I really believe Molly and Mable have been a huge part of this for me. Helping me to create structure, stability and a loving family environment in the ever changing seas of my life as an actor. A reason, amongst many, why perhaps many of my creative friends are never too far from their canine companions! A weekend of long walks and delicious cream teas was calling, and so we looked no further than the wonderfully calming Climping. Within two hours of London and easily reached by train, this spot, recommended by my Dad as he had spent many a happy school holiday there as a whipper snapper, would tick all of our boxes. If you’re searching for some serious pampering for both you and your furry friends, then Bailiffscourt Hotel and Spa is a real treat for the whole family. Nestling in 30 acres of perfectly manicured private parkland and a pebble’s throw from the beautiful and unspoilt Climping beach this little gem seems to be one of the South Coast’s best kept secrets and one I’m excited to share with you! Strangely, this beautiful beach is almost always completely empty…or it certainly seems to have been whenever we’ve headed down there to stretch our paws. Believe me I’m not complaining! It’s certainly saved me from the embarrassment of my partially trained soggy, sandy doggies launching themselves at unsuspecting passers by. Innocently in search of cuddles and/or treats no doubt - but never the less, a habit I desperately need to get them out of! Perhaps next month we’ll be reviewing doggy boot camp! ‘Molly… Mable… where have you gone…..? Come out from under the bed! ?’ (laughs). Talking of beds, it was pretty hard to get out of the seriously comfortable, huge four poster in our Medieval Coach house. I think the million thread count Egyptian cotton sheets had accepted me as one of their own. Had it been a little chillier we might have considered taking advantage of the spectacular open fire place, but alas we were still enjoying the unusually warm, however brief, Indian Summer…so this might have been over doing it. I managed to put in some serious time in the super luxurious spa. Being lucky with the weather, we took a dip in the heated outdoor infinity pool and hot tub. The spa has plenty of relaxation areas inviting you to recline in a fluffy dressing gown and boasts a state-of-the-art gym. There are tennis courts too, if you are feeling more energetic than I was! The treatment rooms are blissful and calming, as are the treatments, which are beautifully designed and tailormade for you using the acclaimed Temple Spa products. Despite the caring, peaceful and unhurried atmosphere at Bailiffscourt, there is no doubt that the staff and management are working incredibly hard to make sure your stay is as enjoyable and recuperative as possible. This quirky, medieval style estate has so much to offer… ohh and don’t oversleep and miss the delicious breakfast, which weather permitting, is served in the walled rose garden… enjoy. Molly’s musings…If I’m going to be forced to have a bath (which is one of my least favourite things to do,) then I do ideally like it to be in a free standing, roll top tub or I may be persuaded to enjoy a walk in shower. Luckily our suite was equipped with both so I didn’t put up TOO much resistance. Mable’s mutterings…They made us feel so welcome, I was even allowed to sit on the receptionist’s lap! I loved that there were lots of other dogs at the hotel to play with. And the treats, toys, food bowls and beds that were left in the room for us were a lovely touch. (although naturally I slept right in the middle of the four poster!) So four out of four paws from me! Not to be missed…The Tapestry Restaurant is a fantastic, locally sourced menu of modern English cuisine created by head chef, Russell Williams. The medieval architecture creates a wonderfully atmospheric setting for a romantic dinner. Go for the wine pairing menu, you won't be disappointed. Although dogs aren’t allowed in the restaurant, they are more than welcome in the lounge afterwards while you curl up with a coffee. To follow last month’s Kurgo Car Harness review, Molly, Mable and I have taken car safety a step further this month by giving the Wander Hammock a whirl. Not only does this easy to install hammock protect your car seats from mud and dirt, it blocks your dog’s access to the front seats. Perfect if your furry friends are anything like mine and are fairly insistent and want to ride shotgun! This hammock hangs between the front and back seats and will absolutely save your car upholstery this winter. Mine is already completely wrecked from muddy romps through fields and woodland but at least thanks to the hammock, it can’t get any worse! Molly and Mable’s coats have similar absorbency to a sponge so this product is just great for us. We can save time messing around, failing dismally at towelling them dry. They can jump straight in the back of the car and curl up there, until we can all get home for an overhaul! Brilliantly, the hammock is machine washable, (if only the dogs were), and fits easily and securely into the back seat of the car by looping the attachment points over the head rests. There are also openings for seat belts or child seats, so it works perfectly along with a car safety harness. This product is a great little investment and will save you a lot of time and money spent upholstery cleaning! Find out more about booking your own dog friendly break at Bailiffs Court Hotel & Spa in Climping, West Sussex online here. 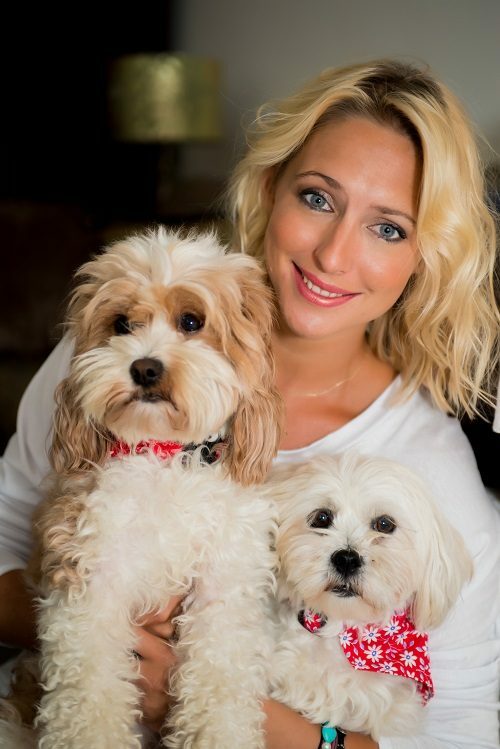 Keep up to date with the adventures of Molly, Mable and of course, Ali on Twitter at @mollyandmable and @alibastian.